Find us | The Goose Is Out! The Ivy House is near stations and on bus routes, and within easy walking distance of East Dulwich, London SE22 (where we were originally based!) It is a friendly place with a wide range of ales and yummy food. It has a great musical heritage, a brilliant stage (no, we don’t hold our singarounds on the stage 🙂 ), and re-opened as London’s first community-owned pub (yes, the Goose has shares!) in late August 2013. There are no stairs, which will hopefully make it easier for people who have mobility issues. There is one step from the pavement into the front bar. Please contact us if you need further information. Click here to go to The Ivy House’s website. The nearest stations are Nunhead (an eleven minute walk), Brockley, Honor Oak Park and Crofton Park. Trains from Nunhead go to Victoria (a ten minute journey). Honor Oak Park and Brockley stations are both on the East London Line, and there are also trains to London Bridge. Trains from Crofton Park go to Blackfriars and St Pancras via Denmark Hill and Elephant and Castle. Peckham Rye and East Dulwich stations are also within walking distance – but a longer walk! The 343, N343 and 484 all stop at the end of Stuart Road. The 343 runs between London Bridge and New Cross, via The Elephant and Castle. The N343 night bus also stops at the end of Stuart Road and its route is extended past London Bridge to Trafalgar Square/Charing Cross Station, via Waterloo. Click here to see the 343 and N343 timetables. The 484 runs between Lewisham Station and Camberwell Green. It passes Goose Green, so if you are coming from East Dulwich and don’t fancy walking, you can get this bus to The Ivy House! Click here to see the 484 timetable. There is unrestricted parking on Stuart Road and also in nearby roads. 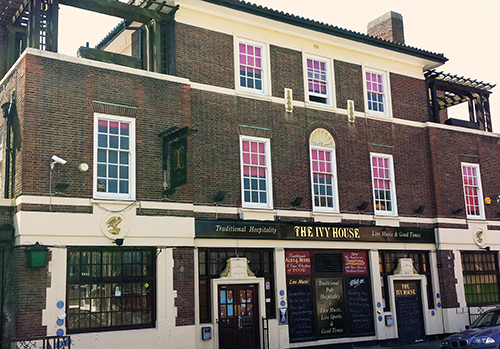 If you need to phone The Ivy House, the number is: 020 7277 8233. We look forward to seeing you at a Goose night!